On the one hand the Sweet Smell of Success is a film that is firmly planted in its production year. The clothes, the music, and the hip dialog, all label it as pure late fifties. Yet, its display of corrupted power and its bitter, almost angry look at the world have made it timeless. British director Alexandar Mackendrick was best known for his Ealing films from the early to mid fifties. He oversaw Alec Guinness in The Man in the White Suit (1951) and received accolades for directing Guinness again in the distinctly British black comedy, The LadyKillers (1955). His next film in 1957 was a far cry from this world of eccentric old ladies and inept criminals. The Sweet Smell of Success, starring Tony Curtis and Burt Lancaster is a ferociously dark noir. Yet, nobody is ‘physically’ murdered and there is very little mystery, which are the usual tropes of the noir style. Lancaster plays J. J. Hunsecker, an arrogant and powerful newspaper columnist, who is the kind of man who can make or break a life with a single word. Tony Curtis is Sidney Falco, a morally weak and back-stabbing press agent who worships Hunsecker and his lifestyle. The film fades in by revealing that Falco cannot get any of his clients’ names placed in an influential newspaper column because he failed to break up a relationship between Hunsecker’s sister, Susan played by Susan Harrison, and a Jazz guitarist called Steve. As the film progresses Falco’s attempts to splinter the relationship become more devious until he does finally succeed. However, Hunsecker isn’t happy at the result and wants Steve’s life destroyed by having Falco plant drugs in his jacket and tipping-off a corrupt detective. Falco, unwillingly goes through with the plan, but is eventually consumed by guilt, as this is too far across the line, even for him. In the final scene Hunsecker’s house of cards tumbles when Susan discovers the truth of his machinations. Hunsecker, in one last desperate attempt to cling to control tries to make his sister seek psychotherapeutic help, and has Falco beaten and arrested. She walks out on him and Falco is last seen being pushed into a Police car. Hunsecker stands alone, viewing the city and the people he thought he could control. The first thing that strikes one as the opening credits appear is James Wong Howe’s beautiful black and white cinematography of a wintery New York. Mostly shot during the twilight hours the contrast between the inky darkness and the glaring lights of the city is dramatic. It’s almost as if the film is a moving portrait of the shots taken by acclaimed photographer Weegee (Arthur Fellig). The film utilizes various locations of the Big Apple without resorting to the normal method of filming on a studio back-lot. In fact Mackendrick claims that the film “was actually one of the first attempts to shoot night scenes on location in the city” (Film in Focus). This documentary style cinematography does more than provide a setting to the characters. It actually allows the city to become a character itself and loom over all the players as if it is the puppet master holding the strings. 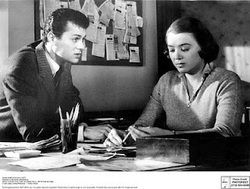 Early in the film Hunsecker says, “I love this dirty town” (Sweet Smell of Success), and the audience has to wonder that even with his unnatural infatuation of his sister, perhaps the cold concrete and glass of New York are indeed his true love. In fact Hunsecker mirrors that city beautifully. He towers over the other characters and is aloof, and emotionally cold. Almost at the same time that the visual aesthetics hit you the music by Elmer Bernstein is heard. It is an adrenalin filled Jazz soundtrack that captures the frantic nature of the characters especially Falco, but is also a statement of the time the film was produced. Jazz was primarily seen as music with dubious moral qualities and during the fifties was usually only used for “films dealing with depravity and madness…drug addiction…and degradation” (Ness 55). Making Susan’s boyfriend a Jazz musician makes it easy for the audience of the time to identify a schism between Hunsecker’s world and the one of the next generation. It also allows the film to mix non-diegetic with diegetic music, as the rhythms leak outside of the confines of the smoke filled clubs. In Sweet Smell of Success this music seems to be the song of the city that creates a rhythm for the characters to dance to. The screenplay was based on a short novel by Ernest Lehman (who also wrote the screenplays for Sabrina, North by Northwest and West Side Story) that was published in Cosmopolitan. However, the screenplay for the cinematic adaptation was penned by Clifford Odets (Time.com). For a film that seems intent on injecting a sense of realism into its story some of the dialog appears to be too artistic to be true. For example when Hunsecker turns to Falco and says, “I’d hate to take a bite out of you – you’re a cookie full of arsenic” (Sweet Smell of Success). It would seem ridiculous if you heard it in the street, but here in context these delicious lines actually work. The filming technique, the music and the way the actors deliver them with conviction makes you believe that in their reality people do actually speak in that way. So when Lancaster says, “this syrup you’re giving out with, you pour over waffles, not J.J. Hunsecker” (Sweet Smell of Success), the audience doesn't consider it odd or out of place, but merely an acceptable form of speech. Each time one of these great lines appears the audience smiles, and there are a lot of lines to smile about. Unlike many films of this period it’s hard to root for any of the characters. There is nobody who is without flaws. Even Susan Hunsecker, J.J.’s poor sister, who is really the only one that is truly innocent, seems too weak to be likable. Her small attempts to break out from her brother’s control are easily corralled, and she spends most of the film hysterically weeping. The Sweet Smell of Success does seem to have an interesting opinion of women. Falco uses Susan, his secretary, called Sally, and a cigarette girl named Rita like objects. He’s only interested in them when they can be instrumental for his own goals, and verbally abuses them when they don’t. In one exchange his secretary offers to help him and he snaps back, “Help with two minutes of silence” (Sweet Smell of Success). When dealing with Rita, Falco isn’t just rude but morally bankrupt. He pimps Rita out to a columnists in order to get a story planted. The fact that the audience discovers that Rita and the columnist have met before doesn’t lessen the uneasiness we now have for Falco. His relationship with women is similar to the relationship that Hunsecker has with him. It’s almost as if the bile Falco receives has to be released onto the women that surround him. The only strong female character is Hunsecker’s secretary, which is understandable. A powerful man needs a powerful woman, but it is apparent that the only way a woman can be a success in this film is if she acts like a man. Other relationships also have complex shifts, none more so than the central one between Falco and Hunsecker. It’s apparent that Falco wants to be like him and is trying to emulate his every move. This subservient infatuation is demonstrated by the simple act that when Hunsecker pull out a cigarette Falco instantly moves to light it. Film critic Roger Ebert best describes the relationship between Hunsecker and Falco as being “like junkyard dogs. One is dominant, and the other is a whipped cur, circling hungrily, his tail between his legs, hoping for a scrap after the big dog has dined” (Chicago Sun Times). Why Hunsecker is kept around is less clear, but then every general needs a soldier to do his dirty work. Or, as one sees Hunsecker’s other relationships it becomes apparent that he enjoys seeing other people squirm and fight for his attention. The other relationship that is pivotal in the film is the one between Hunsecker and his sister. He controls her more like a submissive wife than a sister, and Lancaster, when referring to her, manages to make the affectionate word “darling” seem threatening and full of dark thoughts. This is complicated by the fact that Hunsecker has no wife, or girlfriend, and seems to have no sexual desires to other women. In fact he appears to have no friends in the film, merely people who work for him or fear him. Perhaps this is why he clings to Susan. She is the only person who loves him for who he is, not because of what his power can do. However, during the film he uses his power to contain her and this is his undoing. Susan eventually sees the real Hunsecker, and discovers that she doesn’t love her brother, but just pities him. None of the characters every truly get a whiff of the film’s title. Even Hunsecker with all his power and money loses the one thing that he holds dear. Falco is broken, beaten and arrested, and Susan whilst free from her brother’s grasps may never truly recover. Meanwhile, the city watches, uncaring and cold. Ironically for a film that deals with the hunger for success it failed to ‘eat up’ the box office. Whilst the two main stars were unaffected by its dismal performance, Mackendrick never really recovered and his career began to wind down. In the film Steve says, “Just so you don’t leave me in a minor key” (Sweet Smell of Success) and this is probably one of the reasons the film didn’t appeal to the general public. The downbeat ending, whilst suiting the films dark nature, isn’t uplifting enough when compared to the usual Hollywood fare of the time. Audiences also seemed to have been repelled by the fact that the film is incredibly dialog heavy. However, with a further sense of irony it is that ending and verbal sparring that has increased the film’s popularity over the years.